Many recipes call for the potatoes to be baked for about 45 minutes, but I’ve gone with the quicker option of boiling the potatoes. If boiling, you should still leave the skin on so the potatoes don’t soak up too much water during cooking. You can flavour your gnocchi with cheese: Gennaro Contaldo adds ricotta and Parmesan to his Ricotta Gnocchi and Lorraine Pascal uses Parmesan and mascarpone along with some herbs such as fresh thyme or dried oregano. I’ve gone for a more traditional version to begin with as I didn’t want the gnocchi to overpower my simple butter and sage sauce. But you can experiment with different doughs and sauces. I’m certainly looking forward to trying some different combinations and will of course share any successes! Put the potatoes (skin on) in a saucepan and add just enough water to cover them. Bring to the boil and simmer for about 15-20 minutes, until tender. Make sure you don’t overcook them as they will become too mushy and wet. Remove and holding on a fork peel them. Then pass them through a potato ricer into a bowl. It’s easier to rice the potatoes while they are still hot and avoid lumps. If you don’t have a ricer, give them a good mashing with a potato mash. Add the flour, nutmeg and ground almonds to the bowl and make a well in the middle. Break the egg into the well and beat with a fork. Then fold in the potato and flour mixture and knead to form your dough. It should come together quite quickly. You don’t need to knead like pasta dough: over-kneading with make the gnocchi too stodgy. Shape the dough into a rectangle and slice into about 1 cm strips. 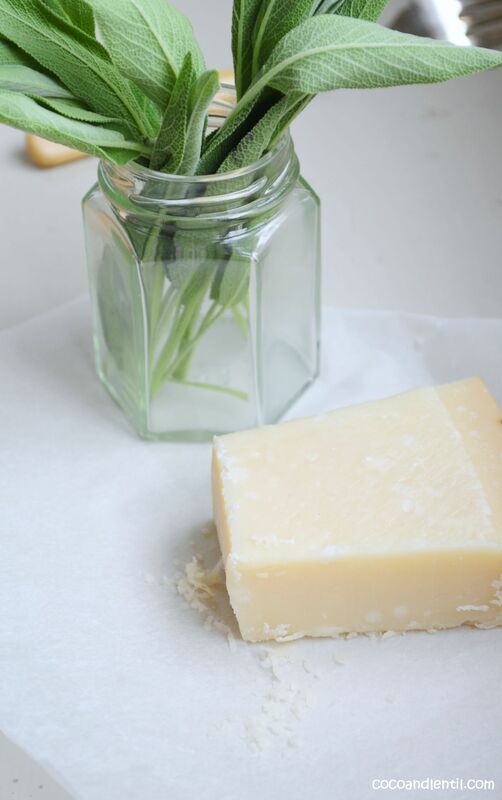 Using spread fingers roll each strip out into a long ribbon and then cut into little gnocchi squares / rectangles. 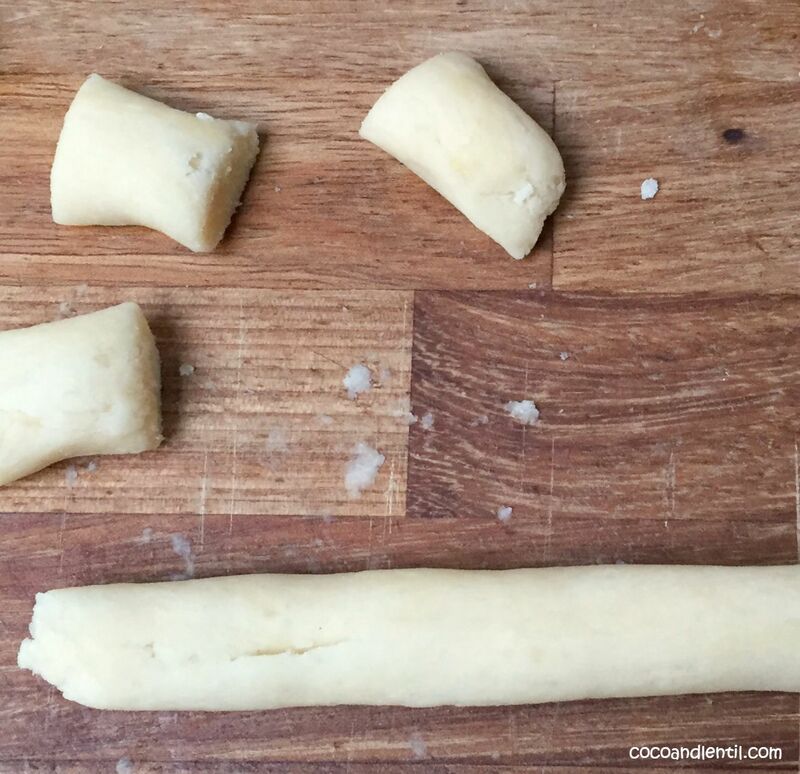 You can make ridges in the gnocchi using a fork. It makes them look nice and according to Delia (and who am I to argue with Delia?!) helps the gnocchi absorb the sauce effectively. I did half and half. I don’t think it made much difference to my dish, but undoubtedly the ridges would be better for a heavier or creamier sauce, such as a tomato sauce. Toss the gnocchi with some flour to avoid them sticking to each other before cooking. Shake any excess flour off the gnocchi and add the gnocchi to a saucepan of boiling water. They should float to the top after about 2 minutes, then leave for another 1-2 minutes. Meanwhile, melt the unsalted butter in a saucepan and add the sage. Cook for 1-2 minutes. Remove the gnocchi from the water, drain well and tip into your saucepan of butter. Mix well and cook for a further 2 minutes. Serve the gnocchi immediately and sprinkle some Parmesan on top. 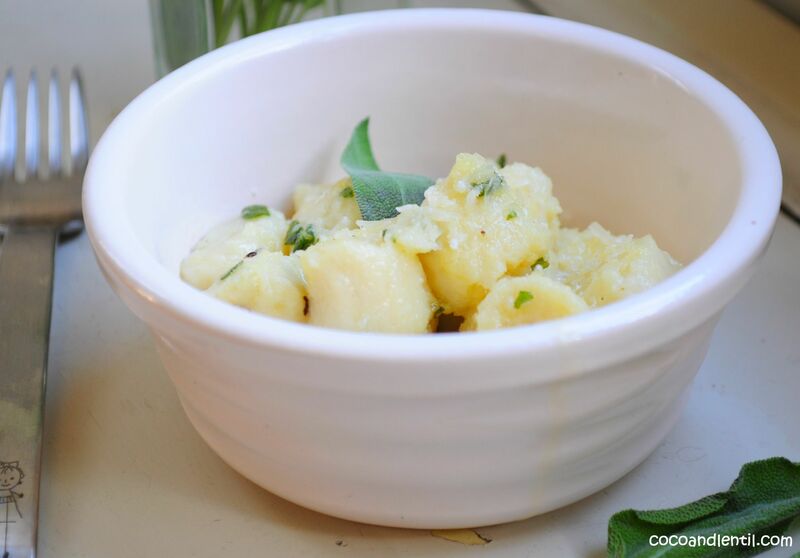 If you want to freeze the gnocchi, remove from the boiling water and drain as above. Place some baking parchment on tray and sprinkle with flour. Add the gnocchi and place in the freezer for at least two hours until the gnocchi are complete frozen. You can then remove the gnocchi, divide into portions and place in freezer bags before popping back in the freezer. It can be frozen for about 6 weeks. Cook from frozen. Thanks Hun. Yes, they’re simples! Love that this is a generational recipe. 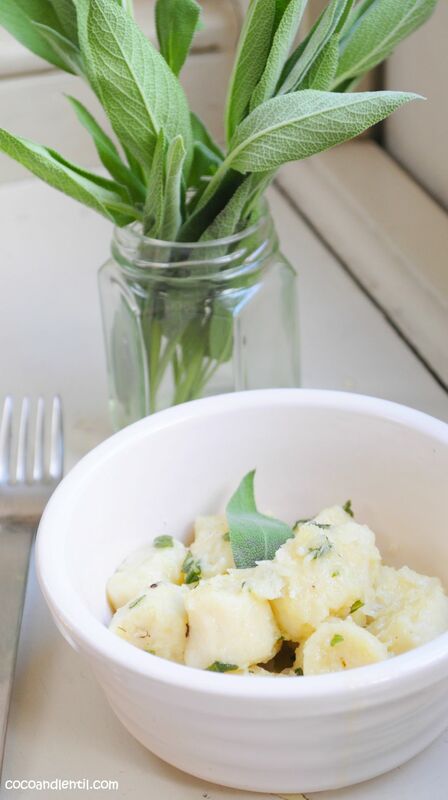 And hello the combo of sage, butter and potatoes…kinda killer. I know, can’t go wrong with butter and sage! It actually sounds more complicated and time-consuming than it is. 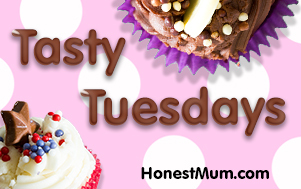 It’s actually great for a quick midweek meal: one of those days when you find the fridge and freezer have miraculous emptied themselves without you realising!